Ronald Paul Ricard, 95, of Bowling Green, Ohio passed away Thursday April 11, 2019. He was born February 17, 1924 in Portage, Ohio to Benjamin and Zilpha (Sheets) Ricard. He married Marvalene Humphrey on June 23, 1949 and she survives in Bowling Green. Ron was a 1942 graduate of Liberty Township High School. He then went on to obtain his Bachelor’s degree from Ohio Northern University in 1951 and his Master’s degree from United Theological Seminary in 1958. During World War II, he served in the United States Navy and sang with the Navy Choir. Throughout his 33 years as a pastor, he faithfully served as a minister for the following churches: Hepburn Evangelical United Brethren (EUB) Church in Kenton, Ohio (1948 - 1950), Columbus Avenue EUB Church in Sandusky, Ohio (1950 - 1954), Memorial EUB Church in Sidney, Ohio (1954 - 1959), Forest Park United Methodist Church in Lima, Ohio (1959 - 1972), and Fairborn United Methodist Church in Fairborn, Ohio (1972 – 1981). He will be remembered for his humor, love of music expressed in his tenor voice, and his strong faith. Ron also served as director of planned giving at United Theological Seminary in Dayton, Ohio for four years, and as Director of Youth, Director of Stewardship, and Director of Christian School Missions for the Ohio Sandusky and West Ohio United Methodist Conferences. Ron was also a past-president of Metropolitan Kiwanis of Lima, Ohio and a member of Bowling Green Kiwanis. He served as president of the Allen County, Ohio Council on Alcoholism and Drug Abuse and The Allen County, Ohio Ministerial Association. He enjoyed woodworking, fishing, his Lyman boats, volunteering on work projects for his church and community and traveling with his wife to Russia, Alaska and Europe. He and his wife also enjoyed volunteering together and traveled throughout the United States on mission trips. Ron was a member of First United Methodist Church in Bowling Green. Along with his wife of nearly 70 years, Ron is survived by his children M. Ann Bender of Allison Park, Pennsylvania, Steven P.H. Ricard (Beth) of Bowling Green, Ohio, and Rhonda Ricard Gilmore (Jim) of Ithaca, New York, brother Thomas (Jeanne) Ricard of North Baltimore, Ohio, 7 grandchildren and 4 great-grandsons. He was preceded in death by his brothers Emerson, David, Donald Ricard and sisters Angeline Smith and Shirley Vigh. A Celebration of Life Service will be held Friday May 17, 2019 at 2:00 p.m. at First United Methodist Church, 1526 E. Wooster St. Bowling Green, Ohio 43402. Visitation will be held that afternoon from 1:00 p.m. until the time of the service at 2:00 p.m. Funeral arrangements have been entrusted to Dunn Funeral Home in Bowling Green. 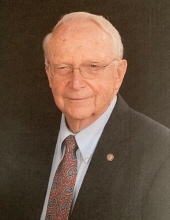 Memorial contributions may be given in his memory to First United Methodist Church in Bowling Green, United Theological Seminary in Dayton, Ohio or the Heifer Project in Perryville, Arkansas. To send flowers or a remembrance gift to the family of Ronald P. Ricard, please visit our Tribute Store. Guaranteed delivery before Ronald's celebration of life service begins. "Email Address" would like to share the life celebration of Ronald P. Ricard. Click on the "link" to go to share a favorite memory or leave a condolence message for the family.